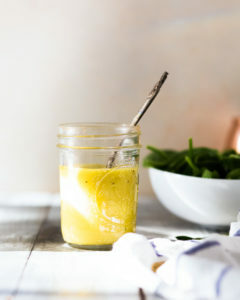 A versatile dressing or sauce that can be used in all sorts of different dishes. We love it in – chickpea salad, on baked potatoes, as a substitute for traditional coleslaw dressing, or as a simple dip for veggie sticks and seed crackers. Add all ingredients into a jar, tightly secure lid and shake until well combined. If your tahini is extra think, a stick blender (or thermomix) is also useful to combine and aerate the ingredients.